At the very beginning of 2008 I used my Sabian to meditate and connect with a few interesting people. One of them was Diana and I have printed that chat now and I also had two with Elvis. I am quite aware that people will write me off as some ditzy loon and Im happy to be one if thats the concensus but having said that I know different. We do have the power through meditation to 'connect' some people and not just through mediumship - I am not a medium but I do get insights and I tend to use divination tools to listen as well as read what they are giving me. Elvis was an amazingly spiritual person - I feel good in conversation with him and comfortable that he was the person talking to me. . Elvis appeared quite voluntary about what he gave. Though most of the divination on this blog is through Tarot as that is my principle form of insights, I still think it is interesting to present other types of readings that I have done and the results of them and I do hope you enjoy this chat with Elvis as much as I did receiving it. My mother was a fan of Elvis for absolutely years and she is psychically gifted. Through my own mother I received quite a few messages which all came true for me personally and Elvis also predicted the birth of my nephew through my mother. Vernon Presley did write to my mother and when she received the letter she was totally amazed as she had sent Christmas cards to Elvis family for quite a long time. When I picture Elvis in Meditation he makes me laugh. He is sitting on a big leather chair its quite wide at the back but I still think its a very upmarket creation from the seventies..Most of the room is black red and gold. He sits there in black with his cuffs undone and very shiny shoes slightly pointed at the toe. He is always grinning and I have tried really hard to find a photograph to capture the image of him and the one pictured above is almost a good replica of what I have seen in my mind. Hes real cheeky giving me the youthful look !! but its still a wonderful impression of how he came across to people. Elvis is VERY real and he has absolutely no problem connecting with anyone who seeks his advice. All I can say is try it and see!! Elvis is and always will be a favourite to talk to but already it seems hes been in my family for years - hes probably grinning about my mother, shes even more eccentric then I am!! Well fast forward to the first conversation and again I just write down exactly as I got it - so you will receive all the spelling mistakes and mistakes that I made in translation. Thank you Elvis for being everyones spiritual friend. I had a conversation tonight - with Elvis. Here it is. Elvis - do you want to talk to me? Sabian shows me a symbol of music, rhythm and dance. He said hes doing everything by himself now. He calls it the immaculate conception. He says he has no one to ask to help him anyway. I think this is his way of talking about how his life was in that he had people doing everything all the time around him. Now, its just him he says. 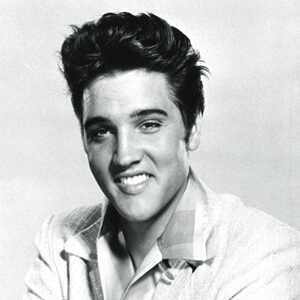 Elvis, can you give me a few words to prove its you that I am talking to? He says hes an old man. He says that he tried to give out advice and wisdom but he just thinks that a lot of people were not ready for it. He says its not that what he was saying was,nt true, its just that others were lacking awareness though there were some who did instinctively know what he was trying to put out. I seem to feel that he says he was giving out subliminal messages trying to unite diverse people to a common cause. I think it is him. I have a feeling of reverence and ceremony here. Being told to light a candle ( like they do at concerts). He tells me that he wanted to opt out. It was due to rules and regulations, restraints I think. He said sometimes things were unbearable. He wanted to maintain a free spirit. He said there are 'consequences' for not 'playing the game'. Maybe he felt he had to conform or live up to too much?...He had a streak of rebellion. Even though he cared for people he feels he 'left' situations. He seems to feel that he is or was wrestling with his concience. I am not sure what he means but he says something about having to leave family and home for reasons 'they ' dont understand. Now Im not sure if its the people that are left behind that have thought that, i.e., leaving a mystery behind him or whether he himself is thinking that. I think he was just tired of being involved in a physical and mental way. I hope he is not telling me what I think hes telling me! He says freedom is never the result of compromise. Hes talking about Graceland. He said everything was hoarded there like a museum. He said it seemed senseless having that stuff all hanging about like that when it could be put to a better use! He says it stores the wood up for winter now! I think he means that the best use has been made of it. He is saying that there can be greater benefits then letting things stand as monuments and memories! He talks about gathering up resources and preparing for harder times. I think he probably means that the money from Graceland will be of benefit rather than to just let it stand gathering dust. He said he was surrounded by abundance - more things than he could ever have experienced at once. So many things that he had to look outside of that and realise that there was much more to feel and sense than just 'things'. I think he is talking about spiritual aspects here. He said he was a bit of a jack of all trades. He counted his blessings. He said he was very restricted and bound in reality. But, he said he did feel safe. He said friends and family enriched his life. He enjoyed being surrounded by them. He felt responsible for them. I asked him why he died. He told me about a quarrel and something about perfume. I think he is trying to tell me he had a quarrel with a woman. He said he had to let everything out. Like a release. He said it was like holding things in and it burst. He said that there was nothing he could do about his 'initial outburst'. He talks about upsetting people. He talks about people being 'kept apart' because of unacceptable circumstances. He says about the truth coming to light. Regarding the music, he said it was like being invincible. Its like people thrust this idea on him that he realises that through his music he put himself in that position and accepted the consequences and responsibilities of it. It was as though he was a leadership and people expected a lot off him. I said what did you feel about that? He said that he let his aggression out sometimes in groups. In a way because he would get involved in some aggressive sport, he did so with his friends so that in a way it was more acceptable! But I think he knew he picked on people sometimes that were weaker than him and he says that was not right. He is talking about guns. He used guns to shoot around the grounds. He said that helped to get rid of anger. I said , what else did you feel Elvis? He said, he was racking his brains sometimes because he felt there was no rational guidance to his life. He said when all was quiet there was a deep part of him that turned to inspirational thoughts - he said his head was so noisy all the time - he needed to switch it off and listen to other thoughts in his head. When he did this, he became inspired because he was able to suddenly hear and think things when he quieted down his mind. He said he began 'breathing in the spirit'. He said in his everyday life - he had it all - and he was opening his mind so that some divine thoughts could blow into his mind. He liked to open the windows and doors. He thought he should open his mind to the unknown - I see a feminine influence here too. He said its like a pathway that you dont go - but whether he was scared or not he wanted to find out. I asked him what else do you want to tell me. He said he is still an activist wanting to get up on his soapbox and be a revolutionary. Its like he wants the power to do things in the world but of course he cannot. Hes talking about being radical but he is saying you have to take a stand against things that are unfair and destructive. I think hes talking about the world today. He still has burning passions. I think hes talking about political brainwashing. I think he feels that everything has gone too far that people are extremist and he mentions religion and political fundamentalists. I think hes against conservative thinking. He thinks some things are narrow minded - I think he sees far much more and is open and can see the problems we are all suffering. I said, Elvis, what do you think things should be like then? He said - a Kundalini awakening. People should be awakening to everything. Reach for meditation and question the meaning of life. He said you have to look through everything to get to the heart of the matter - self realization. I said, Elvis how do we do this, how do we overcome oppression? He told me this. You look for spiritual understanding of concrete objects. He said pierce through appearances - in other words, dont accept what you see and hear - look right through it - He said concentrate on philosophical things and bring those thoughts out into the open. In other words, tell people. Spread the word. He said to look to the signs and points to a skull, the cranium. He said its knowledge beyond books. He said what he meant was, we are bound by social conditioning, conservativeness. He said we have to break down the barriers of that. He said you have to sacrifice yourself to the larger picture. He said old traditions of the old days no longer work. He said we are all worn down - battered and bruised by the establishment. That people are under emotional assault and are feel like life is wearing things down. He said sometimes you think you cant hold out - but he said love and compassion need to be employed. He said spirituality takes practice and he was a rich boy and I suppose he felt that the two kind of contradicted each other. In other words, he knew he should practice what he preached. I think he is admitting to the fact that he was still learning all about spirituality. I asked him, what do you think about Priscilla now. And hes laughing his head off. Hes messing about - he is just being mischevious now and wont open up. I think he thinks its funny!! He said she is using her talents for Graceland and thats what he said! I asked him is there anybody you love very much on earth plane you want to send a message to. He said its not that he is extinguishing his feelings but he said that he is in control of them - I think he has maintained a steady emotion on everything. I think he appreciates that many people still love him, but I also think he feels it is adulation wasted in a way - because he feels there are others who need that kind of love. In other words rather than worship someone - spread the love about. Wise man is Elvis. I asked him if he would talk to me again. The answer to that was - there is a supply to every demand..lol..and an affirmation. He said its a transition time and new realisations are emerging. He has told me there is a welcome next time I talk to him. I asked Elvis if he wanted to talk to me tonight. He said it was like renewing old bonds so I knew it would be alright. I asked him if he would tell me things nobody knew. He said to me that he realised that I need to prove things to others. That if I could prove something then others would believe he was talking to me. Hes got that right but I feel auful - its like having your mind read! I asked him if there were any recordings of him that nobody knew about. I did,nt say music I said recordings. Hes mentioned the ARMY here. Im not sure but I think there is some film of him to do with the army that has not been shown? I asked him about songs - He said something about a christmas song that nobody is aware of that he did.It could be a gospel version of something. He said something about Holly and Mistletoe. I asked him where these things are being kept - and he said in his "Storehouse". I asked him about where he died. Elvis has interjected and said he was like a wax dummy on display. He knows that he was in an open coffin . He said in life you have to walk the walk as well as talk the talk. He did not feel like the Elvis he was. He said also its alright what people see on the outside, but they dont know what goes on in the inside. He is talking about putting on a false front. Im going to have to run with this for a minute I think. I asked him to tell me something that was not public knowledge. He told me this. He said he felt that his 'sexual power' was taken away almost like he was neutered. He said he felt ineffective and impotent. He said whether he was a hot shot or not, he had to get rid of people around him in 'that way' because it interefered with his spirituality. He said to get into spirituality he felt the need to purge many emotions and he said it was like a priesthood. He said he wanted to represent purer spiritual values and you have to let go of ego in order to do that. He said he dismissed people and gave them redundancies because they were not right around him at the time - and because of his new feelings towards the higher soul. I asked him what else the wider public might not know. He said, he loved to play 'hide and seek'. He said he liked to play that in groups and that everyone grew more imaginative each time the game was played. I said. Elvis tell me about your mother? He said he used to get messages from his mother even when she passed. He said he tried to learn all the lessons of experience from her. He felt completely guided by her and never lost her sense of spirit by his side. He said his mother was very conservative though, and he would often feel he needed a nod of approval from her. I asked him about his brother that died at Birth. Not sure what he means by his reply. But he tells me about an interest in oriental ways and methods. I asked him what he means and he told me that to relieve stressful feelings to do with his brother - he used to squeeze oriental balls - do you know the ones I mean, they are chinese or japenese and you squeeze them in your hand. I think he used to do this. Hes just put a sumurai sword in my mind. I dont know why, but I think he had one. He said about a connection to the American Indians. He said that he felt something towards them. He seems to have a concern for them. He said these people need to have faith in the future as he felt that they had been left in the dark. He is concerned about Governments. He told me about the NORTH EAST and that there is some dark void there. He said that to touch higher truth is connected to SIRIUS. He put a yellow cadillac in my head. He is telling me about telepathy now and that we can communicate if we want to. He said to talk to him and forget about social expectations. What hes telling me is whether anyone believes we are talking or not - it does,nt matter because we know we are able to speak to each other. I have asked him if there is anything special he wants to tell me. I think hes thinking about it. I asked him what was his favourite thing - and do you know he told me that he really enjoyed his breakfast!!! I asked him if he had a message for Lisa his daughter. He says he remembers playing with her on the lawn. There were steps up to it . He said she must keep going the way she is as she will soon reach peace that she has in sight. He said she may have to try a little harder but she will get there. I asked him if there was any secret he wanted to tell me. He told me he was fragile when he was born - needed a lot of nourishment - and care. It seemed he should have been in an incubator when he was a baby, I dont know if he was, only what he has suggested to me. I asked him about dying again. He just said that he had too many reponsibilities on his mind. He said he was overloaded and theres only so much you can carry in weight. I said to Elvis. Did you enjoy your life. He said that he was tied to apron strings and really he had to live up to too many expectations and that he wanted to always be free to do his own thing. He said in a way his mother did live through him, because of her own life. He is saying that his mother lived through his life really and projected her own life on him in such a way that she sometimes missed the point of his creative potential. He felt that he was moulded in a way and that he did have his creativity slightly stifled. I asked if he led a happy life and was he doing what he wanted to do. He said that really he feels he broke a kind of barrier down against all the old traditions but by doing that he ended up sacrificing himself for the bigger picture. So really Elvis was such a phonomenon but more to other people than he really could never imagine himself as. He said there were times where he just needed that time alone - so that he could think before getting back to business. Reflection was very important to Elvis. I wonder if anyone else realised that? Elvis tells me now about himself he says people expected him to act in a stereotypical way, he could only really be himself in a very small group of people. He said he could speak his own language with them, but sometimes even in a crowd he felt lonely and alienated. I said to Elvis are you happy now. He said to me, he felt like he left a lot of people disappointed and 'wanting' - but he said people expected too much of him in the first place - its like they only remember his last performance for a while and then they wanted him up there again. - I think he found this utterly exhausting - its as though no matter how much he put into things they wanted more and more and more. Elvis said its alright being important, but if you look up at the stars in the night sky, we are all really stars, - he said, we may feel like tiny little specs when you think of the whole universe, but each and everyone of us is equal and important. He said about his fame, people should really have also looked at other things in life, the little small things because those things were more important. Elvis will be there to talk to me again. He said that he has manifested in my imagination and mind and that I am at the right place at the right time. I truly feel I have connected with him - he is a very loving and spiritual soul who is putting all the earths wisdom before me and telling me about the bigger picture and enormity of the universe. Just wondering ? Was that your x or was that his idea ? Reason I ask ,my Dad use to sign his name with an x , and he always caught heck from the secretarys'. My favorite song Elvis ever sang was the one he sang in German , " Wooden Heart " ,and with the children singing in German language. Maybe you know about him and Peggy? ,this was before Priscilla. Funny thing this interview , My Dad pastaway 5 years ago , I went outside in the backyard an sat on the doghouse roof. Very sad ,looking up at the stars . I heard Elvis's voice he said " they're gonna start on you, now that he is gone ." I wanted to keep crying ,but I was so shocked by hearing his voice. I wiped the tears from my eyes , and thought why ? Anyway, he was right . My family has put so much stress on me with my identity , its unreal .I don't understand why? So ,I wondering what it was like to live the isolated life he and Lisa Marie did. I wrote a song ,I still have it .Its in my store house too. Its actually a lulluabye to Elvis from Lisa Marie .Kinda like me wearing her shoes.If I could contact her she may be able to do something with it.It has 5 verses.Maybe you could ask him about that too. Did he and Peggy ever have a child ? The reading with Elvis was a couple of incidental readings. There is no mystery about the 'x' I just sign like that sometimes. I have never heard of a peggy, and my own favourite song was Wooden Heart. I have to meditate to 'talk' to people but at the moment there are many missing children and I think Elvis would approve if I gave my time there?